One wouldn’t guess it by looking at the fruit, but star apples and sapotas are in the same family. Unsurprisingly, then, that both of their origins are in the Western hemisphere. As explained by Julia Morton in “Fruits in Warm Climates,” the fruit’s naturalized at low to medium altitudes in Mexico to Panama. Botanists debate the precise origin of caimitos: some claim Central America, while others assert they’re native to the West Indies—Indeed, Jamaicans, Haitians and Puerto Ricans use the fruit often in drinks and meals. 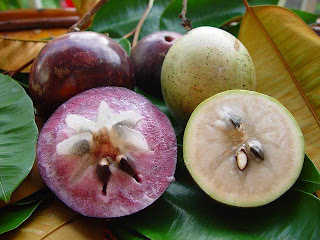 Nobel Prize-winning poet, Derek Walcott immortalized the fruit as belonging to the Caribbean when he wrote the 1979 poem, The Star Apple Kingdom. 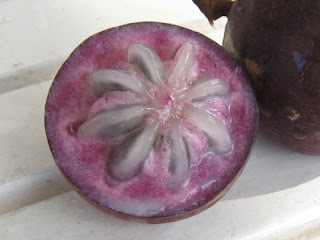 One of star apple’s earliest mentions was by Spanish conquistador, Pedro Cieza de Leon, who described the fruit in his book, Chronicle of Peru. 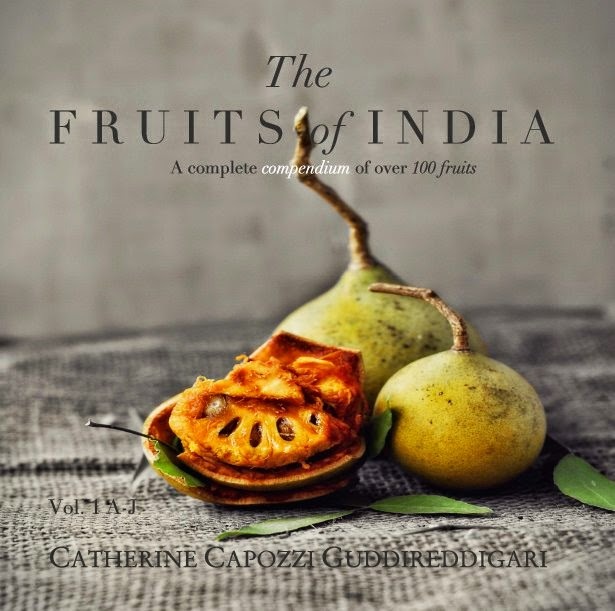 Very likely, India started growing the fruit in its southern states near the time Sri Lanka received seeds in 1802. Today, several more countries grow the fruit including Zanzibar, Cuba, Vietnam, the Philippines, Benin, Nigeria, Peru, and Argentina. 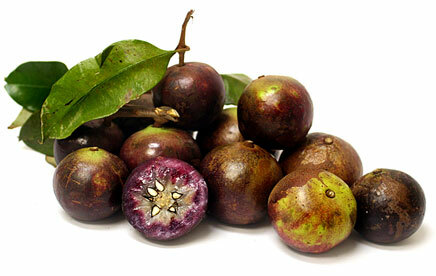 The star apple also grows in tropical parts of the US, most notably Florida and Hawaii on a limited scale. Its large number of monikers is a testament to its diverse geographic distribution, as it has many unique names throughout Europe, South America, Africa, the Caribbean, and Asia. Few countries produce the fruit commercially, and as such, no reliable figures are available regarding its global production. Some countries do, however, process the fruit into frozen pulp. Luxury furniture makers also prize the heartwood for the base of their pieces. Star apples grow in warm temperatures that do not dip below freezing. Caimitos require dry seasons and very rainy wet seasons in order to thrive. Examples of states in India most conducive to growing star apples are Tamil Nadu, Andhra Pradesh Kerala, Goa and Maharashtra. Caimito trees bear fruit in February and March. Cainitos are not a commercial crop in India—this is likely because of a lack of interest and more important, its high perishability. Though cool shipping extends the lifespan considerably, most farmers are not interested in investing such equipment for a low-demand, unknown fruit. The best chance of finding the fruit is visiting the villages of South India during February and March and looking for small, independent growers of the fruit. Unfortunately, even doing this does not guarantee grabbing one of these rare fruits. According to the book, the Fruit and Nut Encyclopedia, star apples thrive in hot, humid conditions in tropical lowlands with an elevation no higher than 1,000 meters. They also require a dry season and strong rainfall in the rainy season. 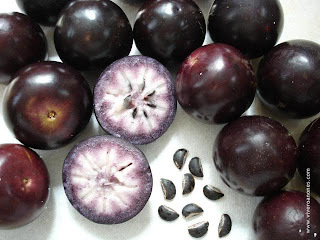 Star apples come in three colors, the most common being a purple variety. Others, however, are green and sometimes yellow. The purple variety goes from green to purple—sometimes a green blush lingers on a soft, ripe fruit. Green varieties, however, require touching them in order to determine their ripeness—if hard, they’re unripe. If pliable and slightly rubbery, they’re ready for consumption. Yellow variants are most rare of all, but they turn from green to yellow and grow soft when ripe. Select bright, shiny fruits with no bruises or visible damage. Caimito’s flesh is juicy, milky, and jello-like, similar to a persimmon’s. The gelatinous flesh near each seed is especially sweet and coconutty. Despite a mildly sweet and agreeable profile, they are not a particularly bold or controversial fruit. In this respect, they resemble fresh figs: pleasant but mellow. Avoid eating the skin, as it’s bitter and full of unappetizing latex. Indeed, roughly a third of the fruit consists of the inedible rind and skin. Indigenous people have used star apples to remedy a variety of ailments. In the Phillipines, some treat diarrhea and dysentery by brewing a decoction of leaves: a bark decoction heals the same. Other countries use the bitter bark to treat hemorrhages and gonorrhea. A long-held belief by some Cubans is the leaf’s ability to treat certain cancers. --According to a 2013 study published in the Journal of Ethnopharmacology, star apple crude extracts illustrate anti-inflammatory and anti-hypersensitive effects when tested in rats. --As per the results published in the Journal of Agriculture and Food Chemistry, star apples contain a number of healthy antioxidants including quercetin, quercitrin, isoquercitin, myricitrin, catechin, and gallic acid. Some of these antioxidants, such as quercetin, have well-known health benefits including being anti-cancerous, anti-asthma, and a regulator of metabolism. Eat star apple like a hachiya persimmon: wait until the fruit is soft, and then press gently along the sides. 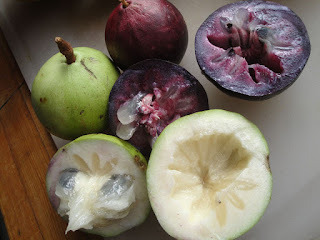 Next, split the fruit in half with the fingers or cut with a knife, and eat the gelatinous, juicy flesh. Spit out the three to eleven flat black seeds. Caimitos do not last more than 5 days or so at room temperature, but will last for three weeks in refrigeration with a temperature range of 37-43F. Star apples work in several dishes. --Blend as part of a tropical smoothie, especially with coconut so as not to overpower the subtlety of the caimito. --Make a classic Caribbean fruit salad called the “holy matrimony:” simply mix star apple, oranges, and add a pinch of nutmeg. --Create a star apple whip topping by folding in the pulp into any standard coconut whip recipe. Add atop tropical fruit salads like mango, banana, pineapple, and kiwi. Cubans refer to two-faced people a caimito leaf: this is because the front of the caimito leaf is dark green, whereas the underside is golden brown. Star apples also form the basis of a Haitian proverb, which is “li chich kou kayimit.” Loosely translated, this means a person is a tightwad--star apples prefer to shrivel and dry up on the tree rather than fall and be eaten.